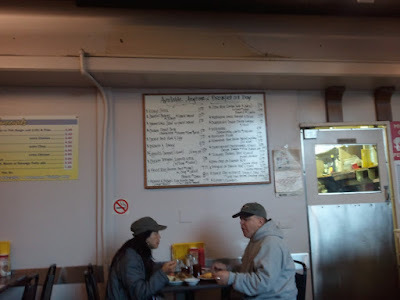 When I started the French Dip Reviews blog, got a Twitter account and soon thereafter was very surprised to learn of @FrenchDipSEA, who is owned by Misty, a great gal who I've since gotten to know. This was our first time meeting in person and we had a very fun lunch and got to talk about the dip. Turf's dip was recommended to me by my good friend Charlotte's brother Owen. 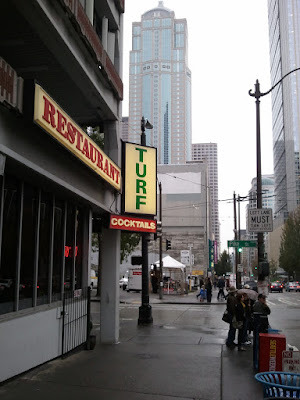 Owen is in the food industry and told Charlotte that Turf had a good dip. I was about to find out! When I showed up, I pretty much laughed at the place. It was in a pretty seedy part of Seattle (2nd and Pike) and while I waited for my dining partner for lunch, believe I witnessed drug deals even. The place looked pretty seedy and the clientele were in some cases homeless. A far cry from Bellevue and the eastside but good for your soul!!! 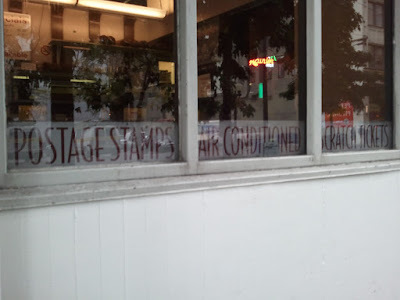 Postage Stamps, Air Conditioned (it was probably 45 degrees and raining), and Scratch Tickets. What more could a person want? I knew what I was going to get so this was no big whoop. I was surprised and happy that they had a Ham Dip. 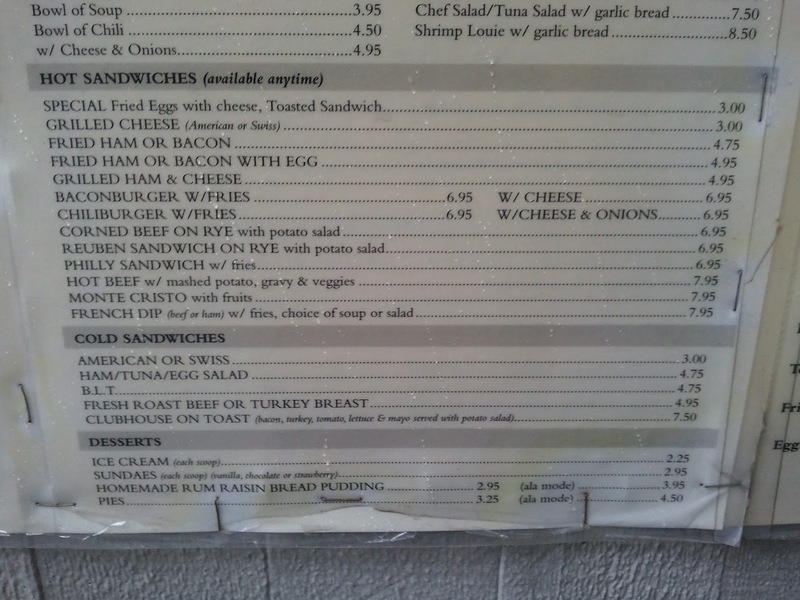 Misty ordered the regular roast beef French dip and I got the Ham dip, so I'd know. 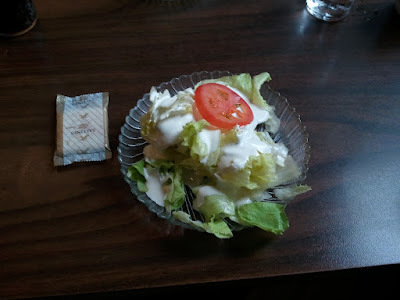 Each meal came with a salad (only dressing options are Ranch and Thousand Island, believe it or not!!!!!) and crinkle cut French fries. The starter salad. Although the iceberg lettuce tasted fine, it was probably the saddest looking lettuce I'd seen in a while!!! The Ham dip at Turf, Seattle. Looks pretty good overall. Fried ham is yummy in general. I had to order more au jus but that's okay. None: this was a VERY classic French (ham) dip. Fair portion. They did have the ham WILDLY LOPSIDED in terms of portion between the two halves. 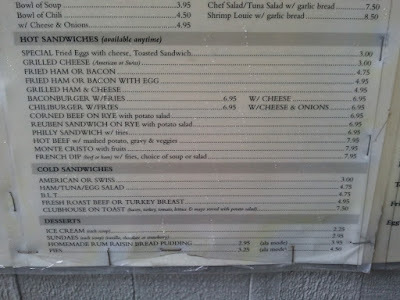 Although this picture's not clear, they have a very wide variety on their menu and specials. The experience of going to this pretty funny, quaint dive and meeting Misty, another (the only other?!) 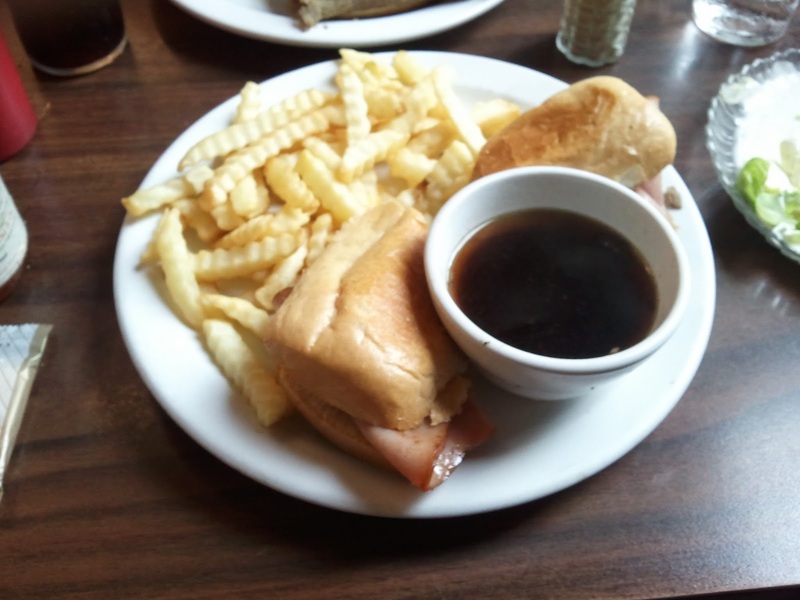 French dip fanatic, was very fun. Our middle-aged, Latino waitress was also very cute and nice; the service was pretty good overall. A great time at a place I wouldn't frequent again. Fair, standard French dip roll. They grilled it on the grill and slightly burned it even. The ham was okay. Misty didn't like it, though. The roast beef was chewy and well. This was pretty good jus overall. It had good color, wasn't too salty and looked pretty good. This was a fun experience just because it was so run down and "classic". Reason to go back: I think I'd try some of their other stuff. They had Lumpia and a really wide array of menu items. If I happened to be in downtown Seattle and wanted a greasy spoon, totally down to earth place to grab a cup of (probably just good enough) coffee and some greasy hashbrowns with ketchup, I'd drop in.